Are you a landscaper that has to care for spread-out lawns? 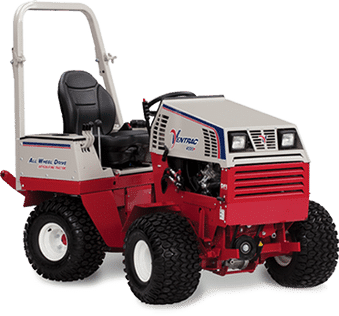 Ventrac Australia is the leading supplier of commercial riding mowers that are renowned throughout Australia for their excellent performance, durability, fuel economy, and reliability. Our wide range of commercial mowers are perfect for maintaining the state of golf courses, sporting grounds, residential lawns, local parks, and other types of sites. As every lawn is different, Ventrac Australia have designed our powerful mowers for comfortable usage while being operated for both easy and hard tasks in various settings. No matter what type of location you are working at, or what the job itself is, no lawn is too tough for Ventrac’s commercial lawn mowers. This will help to reduce your workload and increase productivity in a job that might otherwise be harder and be more time consuming with inappropriate or inferior mowing equipment. Ultimately, they provide exceptional performance for heavy duty work that ends with clean, tidy lawns. There are over 30 different attachments available to get the most out of Ventrac Australia’s commercial riding mowers. These attachments take less than a minute to attach or detach, and do not require any tools to do so. They are design to maximise both performance and productivity as there will be less time needed to attach or detach attachments. Would you like more information on our commercial lawn mowers? Contact us on (02) 4625 2308 today!